Do you have trouble hitting a fairway wood? Are you inconsistent and lack the ability to hit a 3, 5 or 7 wood with the accuracy you desire? I can feel your frustration, you eagerly want to learn how to master fairway wood shots. All too often the ball flies low and to the right into trouble, when others seem to make hitting fairway woods seem easy. Fortunately this article addresses the problems, the fixes and drills to ensure you learn the easiest way to hit a fairway wood or metal. In particular 6 reasons why you are not making a clean solid contact and 5 quick fixes and tips to help you hit your woods better. Being able to hit solid fairway wood shots can radically improve your overall scoring. For example consider the following situations a golfer typically encounters on a golf course. On a par 5 you have the opportunity to reach it in two shots and give yourself an eagle putt. Alternatively a good fairway wood shot will leave you within pitching distance of the green with the prospect of a birdie putt. Thus itâ€™s fair to say learning to hit fairway woods off the deck definitely enables you to reach or be close to a par 5 green in two shots assuming you have nailed the drive. Consider also the situation where a poor drive on a par 4 leaves you with a fairway wood to the green. You can probably relate to the feeling of suddenly having to chase par. Typically you start to feel some pressure as you do your best to make up for lost distance, acutely aware of the need to make solid contact with the ball. A word of caution here, it may be prudent to take your medicine and lay up with an iron so as you leave yourself a distance to the green you are comfortable pitching from. Obviously itâ€™s your decision and ultimately you need to determine how confident and relaxed you are at that point in your round. Letâ€™s also not forget that the fairway wood such as the 3 wood is a pretty versatile club in several other ways. Whilst we have so far only mentioned shots off the fairway, the shorter shaft does make it easier to hit than the driver off the tee. A smart strategy is to play a 3 wood off the tee of a par 5 if even your best drive gives you no way to reach the green in 2 shots. Furthermore a 3 wood can be your ally in a bunker with a low lip where you are looking for extra distance. Equally on the fringe it can be used to chip the ball onto the green. It offers a whole repertoire of different shots from hitting long shots out of the rough to adding more loft to the ball by opening the face. Itâ€™s certainly a fun and resourceful club to have in the bag, whether you are hitting it off the ground or from a tee! There are several reasons why you may not be hitting your fairway woods consistently. The art of hitting a good fairway shot comes down to swinging through with the sole of the club level with the ground. Typically instructors like to describe this as a sweeping action. Trouble will occur though when you strike the ball with the leading edge on your upswing. It is important to recognise that the sole of the club is built to move across the ground. The leading edge shouldnâ€™t dig into the ground as such, though it is OK to take a very shallow divot like a scuff mark. Ben Hogan used to do this. There is one proviso, you may wish to hit down slightly in order to give more elevation to your shots. So whilst you are predominantly making a sweeping movement itâ€™s OK to do so with a slight downward blow to the ball. It is important you do not raise your body up during your backswing and downswing. If you do this you will unintentionally raise your swing arc so as your club strikes the ball around its equator. Try not to straighten your hips during your golf swing, but instead keep a consistent height throughout the complete swing. This ensures you make a clean contact with your fairway woods. Take note also that your spine angle should be the same at address as at impact. To prevent yourself from lifting your body you should practise gripping down the club. If you donâ€™t stay down on the shot you will find yourself topping or even worst hitting air shots. An important lesson in golf is to understand there is no need to try to hit the cover off the golf ball. Doing this only creates tension and results in duffed shots. Please dampen any temptation to hit the ball too hard. In a tense situation you will contract your arm muscles and thus shorten your swing arc. This results in you pulling the club head away from the club by a few millimetres making you susceptible to topping the ball. Once tension creeps into our swing, itâ€™s easy to lose tempo and swing faster than you normally do in a relaxed mode. A rushed fairway wood shot often means our arms are bent at impact. This buckling action narrows the width of the swing arc. Ideally at impact your left arm should be straight with the right arm slightly bent. Swinging with your left elbow towards the target creates a poor position call the chicken wing. Itâ€™s essential to maintain the swing arc as wide as possible by ensuring your left arm is straight at impact. Rarely do you get the result you want if you to try to hit the ball hard. You need to be in control and maintain a smooth swing. If you are prone to leaving your weight on your back right foot you will undoubtedly have problems hitting your fairway woods. This is simply because when your weight is distributed in such a manner it is all too easy to hang back as you hit through impact. You will have a tendency to swing down on a steep path that encourages you reach the bottom of the swing arc before the ball, meaning you are likely to clip the top of the ball on the upswing. This is all too familiar for the golfer that swings with a reverse pivot. At the top of the backswing their weight is on their left hand side and therefore they can only transfer it incorrectly to their right side on their downswing. Thus the weight transference is wrongly moving away from the target and leads to a steep downswing. Finally remember to keep your body and head between the ball as you transfer your weight. Itâ€™s all too easy to want to look up to see where you have hit your fairway wood, but unfortunately in doing so you will also lift your body up as well. This action will inadvertently raise the swing plane above where you started at address thus creating a situation whereby the club head hits the ball further up than intended. The result is a topped or thinned shot that can be further accentuated if you suffer from a chicken wing action. Therefore this is a real case of keeping your eye on the ball. Only look up when your right shoulder is under your chin. You will make a less than perfect contact with the ball if you start to sway on your backswing instead of making a proper hip turn. Swaying will cause you to move the swing arc back so as on your downswing the lowest point of the arc is behind the ball. Thus you will strike the ball on your upswing and hit a thinned shot if the leading edge hits below the equator and a topped shot if it is above. You need to learn to use your lower body to turn properly and not fall victim to totally leading by your arms. Too many beginners believe they can play better fairway wood shots by deliberately trying to help the club get the ball in the air. This leads to duffed shots and quite simply the answer is to let the loft of the club do the work for you. Remember when you hit down the ball will roll up the face. By continuing to sweep after impact, you will naturally lift the club head as your body follows through. Here are 5 tips for successfully hitting fairway woods with a solid strike. These fixes will ensure you make consistent contact on every shot. It is clear from the reasons given above that anything that shortens the swing arc is likely to lead to a less than satisfactory contact. Thus you should work on maintaining a stretched out left arm throughout impact so as the swing arc is as wide as possible. Keep your hands and arms relaxed and deliberately loosen them up when you feel any hint of tension. Tense muscles are always a recipe for disaster. Slow your swing down and take a couple of practice swings, particularly when you feel pressure. You should swing in an easy manner, feeling relaxed and at ease with the shot you are about to hit. Concentrate on making a wide controlled arc with your swing. Players have a tendency to sway to the right on their backswing. Thus to overcome swaying with your fairway shots simply take the club head back a little before turning your body. Equally donâ€™t over turn your hips as you rotate your upper body. Through practice you will learn to control these key swing movements. You need to trust your swing, the ball will become airbourne by simply sweeping the ball off the fairway. Your mindset should be to keep your swing smooth and let the club do all the work as it hits the ball at the bottom of the swing arc, namely the end of your downswing. Donâ€™t get caught thinking you will somehow lift the ball by hitting at it. Instead picture yourself sweeping the ball away. The clubhead sweeps along the ground so do not try to scoop the ball up. The golf swing is a flowing motion and not a flicking one. Naturally the ball will spin up the club face, thus let the loft on the club face do all the work for you. Your feet should be shoulder width apart, any further apart and you will find it difficult to rotate and make a proper weight transference. The ball needs to be typically positioned about a ballâ€™s width back from where you usually play your driver, inline with your left heel. Alternatively a similar position can be determined by lining the ball up with your left eye. So to clarify the ball is left of the centre of your address. Setting up like this allows you to stretch your left arm. Remember to maintain the stretch as you hit the ball. A wide arc will ensure the shaft does not lean back severely at impact. You swing thought should be to keep your left arm extended. You should feel like you are setting up behind the golf ball. With the longer shaft you need to position the ball more forward so as there is time for you to square the club at impact. Maintain a straight spine but make your left shoulder higher than the right one at address. You swing plane will be shallower with a fairway wood than with an iron. An iron shot calls for you to lean further forward thus creating a steeper plane. Avoid the tendency to set up with an open stance that often happens with a fairway wood resulting in a position where you are aligned to the left of the target. Take care to ensure your shoulders are lined up parallel to the the target line. So many good pieces of advice in this email…. all of them make solid sense. Andy. I am one of your customers who bought the four magic DVD. Now tell me about the swing path. I believe that the swing path should be inside to straight to target and not follow the arc as the hands would naturally make the arc on the follow through ie the left hand will fould and the right hand will also go over after extending towards the target!! Pls reply. 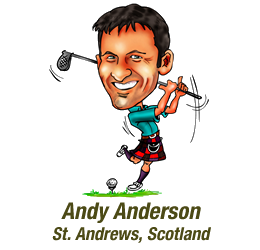 Andy~ Thank you for your discussions on major problem areas in the swing. You have a way of meeting a swing problem with the means to make sound analysis and simplify the correction for an almost immediate good result. One thought I found practice and more practice made the difference on relative to finishing the back swing and completing the follow through – I got from Ben Hogan. He literally wore out a new shirt (heavy beard) in each practice session with emphasis on completing his back swing. First, do a military “eyes right” – POINT (turn) the chin directly behind the ball, then COMPLETE the back swing and be certain your next move is a slight shift left by the left hip (for the right handed golfer) as he fires the right hip like spinning in a barrel leaving his belt buckle pointing at the target or even slightly left of it. In that process the “sweeping” action you describe is truly effectively powering the full extension of the right arm following impact – where, the right arm is completely straight and the club parallel to the ground as the swing has gone from nine o’clock to three o’clock on its way to the finish. In that process, “the SWEEP” at six o’clock may cover as much as 12-14 inches as the club travels along the ground – driver not touching the ground) to three o’clock on to the finish – very much the same with the three, five or seven woods.